Bay View Trail in Sleeping Bear Dunes National Lakeshore is better known as a destination for cross-country skiers than hikers, primarily because of its link to Homestead Resort. During the summer, the lack of impressive dune scenery that the rest of the park is so well known for has many hikers looking elsewhere for a trail to explore. But uncrowded paths is only one of Bay View’s charms. 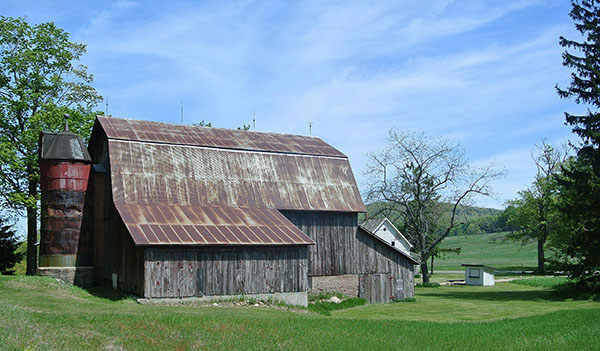 The trail system passes through a mix of beech-maple forest, old farm fields and pine plantations while at its north end features historic barns, farmhouses and a one-room schoolhouse, many of which are being restored by the National Park Service. Bay View Trail in Sleeping Bear Dunes National Lakeshore is better known as a destination for cross-country skiers than hikers, primarily because of its link to Homestead Resort. The downhill ski resort also rents Nordic ski equipment as well as offer chilled skiers a place to warm up and re-fuel after their outing. During the summer, the lack of impressive dune scenery that the rest of the park is so well known for has many hikers looking elsewhere for a trail to explore. But uncrowded paths is only one of Bay View’s charms. The trail system passes through a mix of beech-maple forest, old farm fields and pine plantations while at its north end features historic barns, farmhouses and a one-room schoolhouse, many of which are being restored by the National Park Service. Being only one of three trails in the Port Oneida Rural Historic District (Pyramid Point and Sleeping Bear Heritage are the other two) allows Bay View to offer hikers historic charm as well as a stroll through meadows and woods. A fall trek here often makes for can be a delightful afternoon of spectacular autumn colors and no people. The four loops of Bay View total almost 8 miles with the premiere of the system being a 6.4-mile hike. For hikers the most popular loop by far is the northern half that includes Farms Trail, a side trip to Lookout Point and portions of Low Trail and High Trail for a 3.7-mile walk. This is the hike described here and includes several historic buildings and the most impressive terrain and views. The main trailhead is on the north end of Thoreson Road, a quarter mile from M-22. The trail system can also be picked up from Olsen Farm, Miller Barn and Homestead Resort. In 2015 Low Trail and parts of Farms Trail were paved to be utilized as part of the Sleeping Bear Heritage Trail. Three trails converge at the Thoreson Road trailhead. By heading north you immediately cross the dirt road and begin a long, gentle climb through a hardwood forest to arrive at post No. 1, marking the junction to Lookout Point, at Mile 0.4. This side trip heads east (right) and in less than 200 yards is post No. 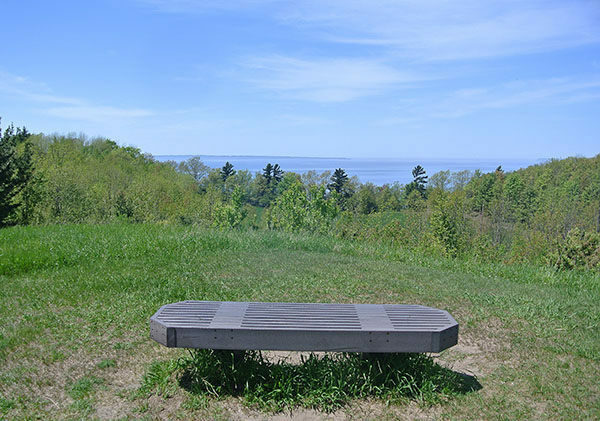 2 on a grassy hilltop where a nearby bench marks Lookout Point, elevation 792 feet or 208 feet above Lake Michigan. 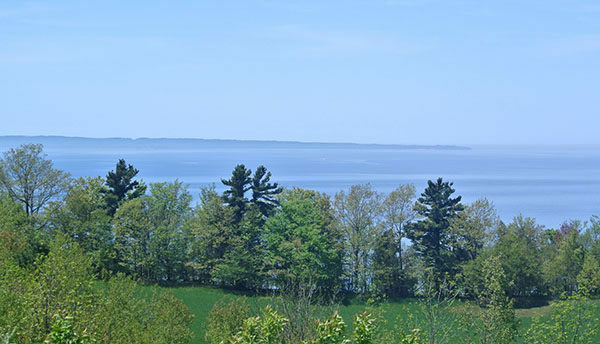 The view includes beautiful vistas of Lake Michigan, Pyramid Point, farms and North and South Manitou Islands. Retreat back to post No. 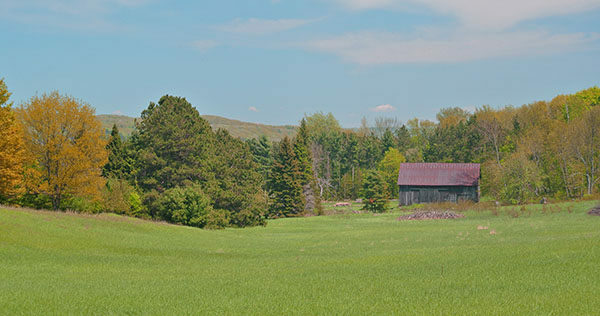 1 and continue north (right) where the trail descends into the woods before breaking out on the edge of field, with Miller Barn at one end. You briefly tread between the open field and the edge of the shoreline bluff, where you can see the Lake Michigan surf through the trees, and then swing east. At Mile 1, you cross Miller Road and pass Miller Barn. The impressive structure, along with a farmhouse that burnt down in 1940, was built in the early 1890s by John Miller. Poke around in the woods near the barn to spot some abandoned farm equipment, including what is believed to be an early corn chopper. From Miller Barn, Farms Trail becomes a mowed grassy lane as it swings past the Port Oneida School, also built in the 1890s. Nearby is a picnic table, hand pump for water and a historic outhouse complete with a half moon on the door. Farms Trail then arrives at the junction where the Sleeping Bear Heritage Trail splits off and crosses Port Oneida Road. To the south (right) the path switches to a surface of a compacted stone and quickly arrives at Post No. 3. Reached at Mile 1.7, the post marks the east end of Ridge Trail, with Lookout Point a half-mile uphill climb to the west. Farms Trail/Heritage Trail continues south in the open fields with a view of the traffic on M-22, arriving at the Olsen Farm at Mile 1.9. The house and barn, built in 1918, were the first in the area with indoor plumbing. A picnic table is located near the house but there is no source of drinking water. From the Olsen Farm the trail swings behind the barn and continues south. At Mile 2.4, the trail crosses Thoreson Road and quickly arrives at post No. 4. The trailhead is just a short walk to the north. To the south (left) is Low Trail, which skirts a field and wooded bluff before reaching post No. 6 at Mile 2.8. Beyond the post Low Trail is paved as is most of the Heritage Trail. But not the spur to the west (right) that climbs more than 100 feet up the bluff, topping off at post No. 5. Your uphill effort is rewarded with sweeping views of Sleeping Bear Point jutting out into Lake Michigan. Post No. 5 marks High Trail. Head north (right) on the mowed lane and more views follow as High Trail dips and climbs along the open top of the bluff. 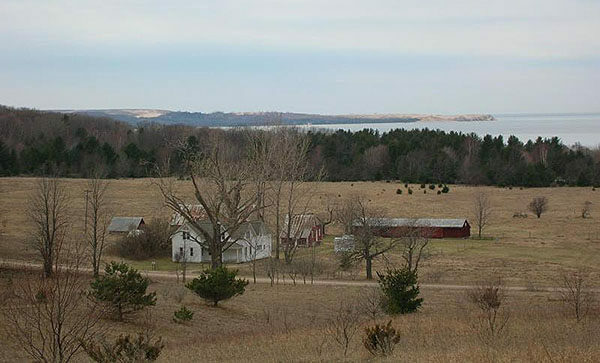 Within a quarter mile, the Thoreson Farm can be seen to the west, framed by Sleeping Bear Point and the Manitou Islands in the background. The farmhouse was built in 1900 by John Thoreson and Ingeborg Sakariasdatte, who emigrated from Norway. The farm has been fully restored by the National Park Service, right down to its dual privies. Just beyond the Thoreson Farm, High Trail enters the woods and begins a descent off the north end of the bluff. At Mile 3.5, the trail swings east, cuts across an open field and arrives at the Thoreson Road Trailhead in less than a quarter mile. Homestead Resort is a year-round resort with lodging, restaurants and equipment rental. For reservations or more information contact Homestead Resort (231-334-5000; www.thehomesteadresort.com/). 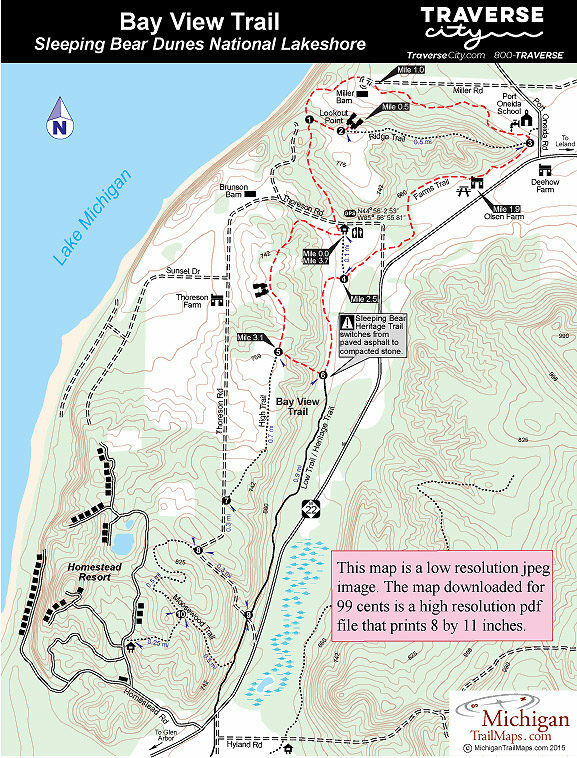 From the town of Glen Arbor head north on M-22 for two miles to reach the main entrance of the Homestead Resort and the southern trailhead for Bay View Trail. Another 2 miles north on M-22 is Thoreson Road where you head veer off to the left to reach the main trailhead in a quarter mile.